For many who have had a near death experiences (NDE), the experience has had a profoundly religious effect on them, changed their outlook and led them to live more altruistic, less materialistic lives. Perhaps, in order to understand NDEs better, we need to understand religious experiences better. Many people have in fact likened NDEs to religious experiences. Although the scientific study of religious experience is still in its infancy, there has certainly been some progress in this area in the last 30 years. Dr Andrew Newberg, a radiology professor and neurological imaging specialist at the University of Pennsylvania, is a leading figure in the study of the brain biology (neurobiology) of religious experiences. 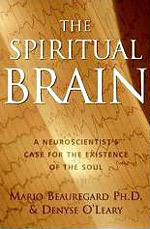 He has used high-tech imaging techniques to observe changes in brain function that occur during meditation and deep prayer. It is thought that his work may ultimately help to show how our minds move beyond the self and open to the divine. In his book Why God Won't Go Away and numerous scientific publications Newberg has described the results of experiments that he and others have carried out. These have demonstrated that prayerful meditation is correlated with a quieting of activity and reduction in blood flow in the posterior superior parietal lobe, an area that lies towards the middle of the brain and is normally responsible for providing us with our sense of orientation. This may indicate how the person meditating is experiencing oneness with the 'sacred' and a loss of boundaries of the self. Studies have also demonstrated that the frontal and temporal areas of the brain become active during meditation. At the same time various chemical changes have been shown to take place in the blood. There is an increase in melatonin and serotonin levels and a reduction in cortisol (a steroid hormone) and epinephrine levels. This makes sense, as the former two hormones are involved in relaxation, whereas the latter two are increased during physical stress. Ultimately, from a scientific point of view, all that we experience, including religious experiences and NDEs, are mediated by the brain. Undoubtedly we will one day discover the molecular mediators of religious experiences and NDEs and also the exact areas of the brain that mediate them, but this will only tell us what parts of the brain are involved in the experiences, not whether the experiences are real. Our brain and our senses limit our ability to determine what is truly real. Therefore until the correct experiments can be done, we may have to move away from thinking about whether NDEs are real or not. We do not have the physical senses to determine whether there is an external reality beyond what we can perceive and we have not yet developed the scientific instruments that will allow us to determine this objectively. Looking for a detailed discussion?